The Summer Award for Research-Intensive Courses is a tuition award offered for a wide range of Maymester and Summer Session I and II courses to give students the opportunity to enroll in research-intensive courses during the summer session. The award covers in-state tuition for one three-hour research-intensive course. 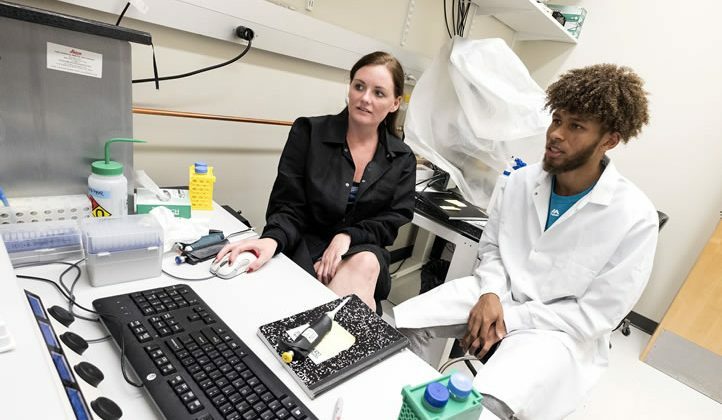 All full-time undergraduates enrolled in a research-intensive course in a baccalaureate program at UNC-Chapel Hill and who are in good academic standing are eligible to apply. To receive the Summer Award for Research-Intensive Courses, undergraduates must also be enrolled in both the semester before (Spring) and semester after (Fall) completion of the course. Rising seniors will receive priority. Eligible research-intensive courses must involve faculty-to-student, one-on-one mentorship. The Standard Course Numbers for mentored undergraduate research courses end in *95 (i.e., 195, 295, 395, etc.). Eligible research-intensive courses must be taught by a full-time UNC-Chapel Hill faculty member who holds a faculty appointment in a department or curriculum at UNC-Chapel Hill. The faculty research advisor may need to establish the appropriate course designation in the department. The faculty research advisor should complete and submit the application for the Summer Award for Research-Intensive Courses Form by April 18. The application and a proposed syllabus should be combined into a single PDF titled with the faculty member’s last name and the year (i.e., Gupta2016.pdf) and submitted via email to our@unc.edu. While the deadline is April 18, applicantions will be accepted on a rolling basis and will be notified approximately ten business days after submission. All funds will be dispersed at the end of April. Staff members from the Office for Undergraduate Research and Summer School will review applications and determine award recipients. Recipients are required to participate in a poster session at the end of the summer/early fall to display the results of their research. They are also strongly encouraged to present at the annual Celebration of Undergraduate Research symposium in the spring, and can also apply to present at the State of North Carolina Undergraduate Research and Creativity Symposium and ACC Meeting of the Minds conference. If recipients are not currently registered for the Carolina Research Scholar Program, they will be invited to register. We anticipate making up to 20 awards. Students may receive a tuition award for only one summer research-intensive course per summer. As applications will be funded on a rolling basis, we encourage you to apply early. Recipients should acknowledge support from Summer School and the Office for Undergraduate Research in any publication or presentation resulting from research conducted in the funded research-intensive course.